That’s the message from a partnered effort between Saint Paul Public Schools, the City of Saint Paul, the Ramsey County Attorney’s office and the Saint Paul Children’s Collaborative. 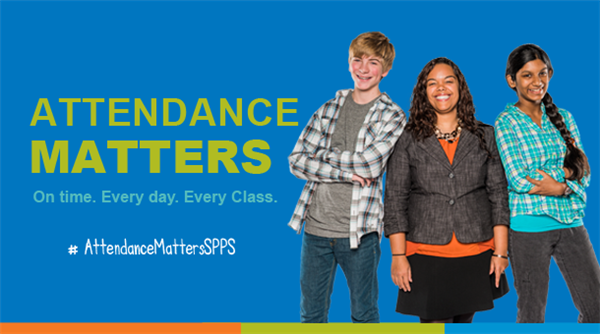 The campaign is an effort to educate students and families about the importance of regular attendance — and how even a small number of absences can impact a student’s learning. Students should miss no more than nine days of school each year to stay engaged, successful and on track to graduation. By sixth grade, absenteeism is one of three signs that a student may drop out of high school. By ninth grade, regular attendance is a better predictor of graduation rates than eighth grade test scores. Missing 10 percent, or about 18 days, of the school year can drastically affect a student’s academic success. Students can be chronically absent even if they only miss a day or two every few weeks. Attendance is an important life skill that will help your child graduate from college and keep a job. In addition to the posters, Saint Paul Public Schools, along with Ramsey County Attorney John Choi and Saint Paul Mayor Chris Coleman, jointly sent out letters to parents throughout Saint Paul reinforcing what families can do to support student attendance. Encourage involvement in school activities, including after-school opportunities. Involved students are more likely to want to attend school regularly. Talk to teachers and counselors for advice if your children feel anxious about going to school, do not have the right school clothes or supplies or if you need additional support. Develop back-up plans for getting to school if something comes up. Call on a family member, neighbor or another parent to take your child to school.